BOB Financial Solutions Limited Recruitment 2019 - Job notification for Asst. 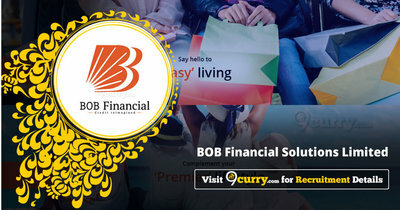 Manager / Manager Post – Tech Lead – Merchant Acquirig in BOB Financial Solutions Limited, Mumbai, Maharashtra. Applications are invited by BOB Financial Solutions Limited (BFSL - formerly BOBCARDS Limited) on or before 20 Feb 2019 for 1 vacancy. Max- 35 Years as on date of receipt of Application. B.E/B.Tech/MCA/Graduate in Computer science/Information Technology from reputed college/University. 4-6 years of experience in Application Support and development. Eligible candidates may Email to careers@bobfinancial.com with the subject as “Asst. Manager/ Manager – Tech Lead- Merchant Acquiring” on or before 20 Feb 2019.